Radiation therapy is treatment of cancer with ionizing radiation. Radiation therapy works by killing cells that are dividing and growing quickly. Cancer cells definitely fit into that category. However, some normal cells are also always dividing, including cells in the bone marrow; cells that line the mouth, throat and digestive tract; as well as cells responsible for hair growth. The death of normal cells is responsible for many of the side effects of radiation therapy. As a matter of fact, one of the major side effects of radation therapy to the head and neck is swelling of the mouth and throat lining, called mucositis. One advantage of radiation over surgery is it can be given on an outpatient basis, meaning your loved one will not have to be admitted to the hospital. Also, there is no risk of general anesthesia during surgery, which is especially important in patients with many medical problems or even just one severe medical problem. Also, radiation therapy treatment could help preserve the organs in which the cancer was found. For example, patients can be treated for cancer of the larynx (voice box) without removing the larynx. One of the disadvantages of radiation is that patients need to come into a treatment facility five days a week for six to eight weeks (though this schedule can vary). Also, there are a number of side effects, both right away and over time, that need to be looked at. The decision on the best treatment will depend on the type of cancer, where it is, previous treatments and if there are other medical problems. Definitive radiation therapy (with or without chemotherapy): Definitive radiation therapy is another way of saying radiation therapy to treat cancer. It can be combined with chemotherapy, which is called definitive chemoradiation therapy. The advantage is that organs can be preserved in some cases. If the cancer is particularly stubborn or if the cancer returns in the same place, the next step will be surgery to remove the cancer. Adjuvant radiation therapy (with or without chemotherapy): This is the use of radiation therapy after surgery to remove all the obvious cancer. Radiation after surgical removal has been shown to reduce the chance of the cancer returning. Neoadjuvant radiation therapy (with or without chemotherapy): This is mainly used in clinical trials or certain cases of advanced disease. In neoadjuvant radiation therapy (with or without chemotherapy), radiation is done, with surgery afterward. This allows the doctors to watch the response, and if there is any cancer left, a surgeon can take it out. Palliation of symptoms: When cancer spreads to distant sites, or when all standard treatments have failed and more surgery is not an option, radiation can be used to palliate symptoms (which means to make the patient feel better or prevent a major complication that could impact quality of life). An example of this might be cancer that has spread to the bones of the spine. This can be very painful, and radiation can treat the tumor without surgery. There are a several different ways to get radiation therapy. 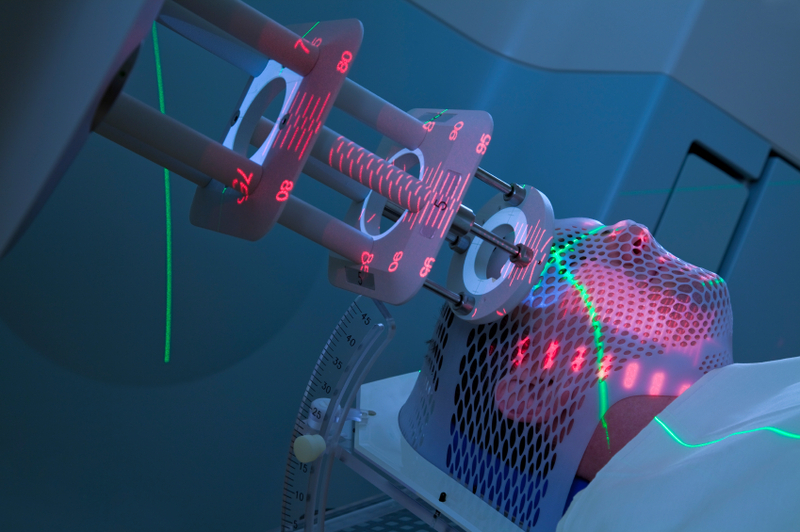 The two main ways to get radiation therapy for most head and neck cancers are external beam radiation therapy and brachytherapy. Standard external beam radiation therapy: This is the main type of radiation therapy for head and neck cancer. Either X-rays or gamma rays are used in standard external beam radiation therapy. A few weeks before starting radiation therapy, your loved one will have a simulation session. In this session, he or she will lie on a hard flat bed and undergo a CT scan. The technician may make some markings on the skin. During this session, a special mask will also be made to make sure positioning is consistent each treatment and the radiation is given as close to plan as possible. The exact number of times and how long the treatments will last will be set by the radiation oncologist, but it will normally be five days a week for about six weeks. Each visit takes less than fifteen minutes inside the machine. Brachytherapy: This is a form of radiation in which tiny radioactive “seeds” are put into the body very close to the cancerous mass. Brachytherapy uses needles or catheters to go through the skin to the target area. The radioactive seeds can be temporary or permanent. The main benefit of brachytherapy is more of the radiation can be put into the tumor while protecting normal tissue, and the radiation goes into the tumor as long as the seed catheters are there. Brachytherapy seed catheters are inserted in the operating room while your loved one is completely asleep. They are put in place so that each implant sits right next to the targeted tumor. Once the seed catheters are in place, your loved one will be taken to the recovery room. The next step will be to load the catheters with a radiation machine. Right now, for the head and neck, the brachytherapy catheters can be left in for about five to seven days to deliver a big dose of radiation, or they can be used as a boost to a very specific area for about two to three days after giving external beam radiation. There are some side effects of radiation therapy. Whether your loved one has side effects and whether there are complications depends on how much radiation is given, how long it was given and what parts of the head and neck were treated with radiation. Xerostomia: The most common long-term side effect of radiation therapy for the treatment of head and neck cancer is xerostomia (dry mouth). It occurs when salivary glands are in the line of radiation. Other than being annoying to patients, including making it hard to eat and speak, there is big risk of dental cavities and dental disease because saliva helps prevent dental disease. While the chance of xerostomia is lower with new methods such as intensity modulated radiation therapy (IMRT), where the radiation therapist can more exactly control how much radiation is given, this side effect is still possible. Most learn to treat this by drinking a lot of liquids and using artificial saliva medicines. Osteoradionecrosis (ORN): This is where bone that has been exposed to radiation dies. The bone can be exposed through the skin or mucosa and can lead to the bone actually breaking. It can cause pain as well as ongoing infections. The main treatment of ORN is really prevention. All head and neck cancer patients who will get radiation should see a dentist before treatment to make sure the teeth are in the best possible shape; any bad teeth should be taken out before starting radiation treatment. After radiation, patients should take very good care of their mouths, including frequent cleaning and fluoride treatments. Odynophagia (and mucositis): This is pain with swallowing. It can be caused as the mouth and throat lining is swollen (mucositis). It can be treated by swishing and swallowing liquids that numb the pain or in some cases with strong pain medication. Rarely, if your loved one is not able to eat or drink for a long time, the doctor might suggest a feeding tube until the most painful part passes. Skin changes: Patients will usually lose hair in the area that got radiation. Also, there may be some slight color changes to the skin or mild swelling. 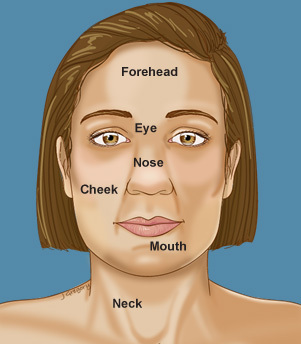 Hypothyroidism: The thyroid gland sits right in front of the throat, so damage to the thyroid gland can happen after radiation for head and neck cancers. This will result in hypothyroidism, or an underactive thyroid gland, which can result in weight gain, excessive tiredness and other symptoms. Hypothyroidism may happen quite some time after the radiation therapy. This can be effectively treated by taking a thyroid hormone substitute by way of a pill once a day. Pharyngoesophageal stenosis: This can be another delayed problem caused by radiation. PE stenosis is an area of closing in the pharynx or esophagus. This can make it hard to eat, particularly solid food. If the PE segment becomes completely closed off, a feeding tube may be put directly into the stomach (gastric tube). Secondary cancers: Even though radiation is used to treat cancer, years later it can actually result in new cancers. The risk increases with high dosage and greater time since treatment. The secondary cancer can be different from the original and could include lymphomas, sarcomas and leukemias. Secondary cancer is very rare.